Our Main Fountain Garden-the jewel of the most significant fountain collection in the United States is now open. Inspired by the great fountains of Europe, this 5-acre masterpiece was created by our founder, Pierre S. du Pont, in the early 20th century. Now, after a two-year revitalization, this Garden will once again dazzle guests with its grand allées, hand-carved Italian limestone, undulating boxwood, and more than 1,700 fountain jets and streams. 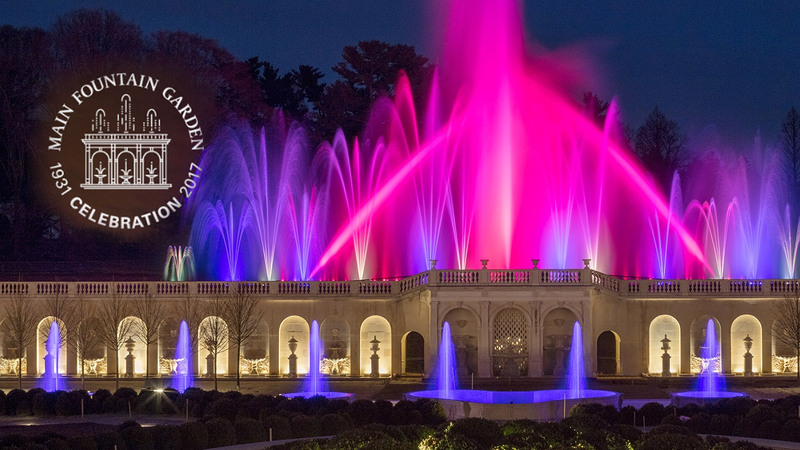 Be among the first to see the Main Fountain Garden perform again! Find out more. We celebrate Founder's Weekend with the premiere of Flowing Water, a compelling documentary that traces the history of Mr. du Pont's inspiration and construction of our Main Fountain Garden, and takes you behind the scenes throughout its revitalization, culminating in the Fountains' glorious return. Throughout the weekend see how our fountains are programmed today, hear from the filmmaker, go behind the scenes of our other spectacular fountains, and more. "The new Longwood fountain will incorporate effects that would make Louis XIV, the patron of Versailles, hold tight to his powdered wig"